How to rip DVD to MP4 with Handbrake with high quality? Disadvantages of using Handbrake to convert DVD to MP4 based on test data. Which is the best free Handbrake alternative to decrypt and rip DVD to MP4 at one go? 1. "How to use Handbrake to rip DVD to MP4 with normal high quality? I've used it to convert several DVDs, all the output MP4 videos are blurry or blocked, and can't be watched at all." 2. "Why Handbrake output .m4v not .mp4 when ripping DVD to MP4? Any difference between M4V and MP4 video file? 3. "Handbrake can't rip copy-protected DVD. Is there an easy-to-use free Handbrake alternative to perfectly convert any copy-protected DVD to MP4 with best quality at fast speed?" All answers are here. This post includes everything about using Handbrake to rip DVD to MP4. Three parts are included in this tutorial: Tips on how to export best video quality for DVD to MP4 conversion with Handbrake; Disadvantages of using Handbrake to rip DVD to MP4; Best Handbrake free alternative to rip protected DVD with no hassle. WinX DVD Ripper - Best Handbrake alternative freeware to rip (protected) DVD to MP4, MPEG, WMV, MOV, FLV, MP3, iPhone, Samsung, etc. with original quality. WinX DVD Ripper Platinum - Rip any protected DVD (incl. latest Disney DVD) to MP4, AVI, MOV, H.264, iPhone X/8/7, Galaxy S8, iPad Pro/Air, etc. in about 10 minutes. Part 1: How to Rip DVD to MP4 with Handbrake with Best Output Video Quality? Handbrake, the most popular open source and free DVD to MP4 converter for Windows (10), only helps users to rip DVD to MP4 or MKV. Admittedly, it's more suitable for advanced users because of its complex interface with confusing settings. Follow the detailed guide below to convert DVD to MP4 with Handbrake. Note: Handbrake can't rip protected DVD alone, so users need to install another DVD decrypter program like VLC to remove the DVD copy protections first. If it still fails to rip DVD with multiple titles, then you are advised to turn to more professional DVD ripping software like WinX DVD Ripper Platinum to rip protected DVD smoothly and fast. Step 1: Download Handbrake (latest version 0.10.5) from its official website and install it. Insert DVD disc to the DVD-ROM and open Handbrake. Step 2: Click "Source" button to load the DVD. You can also choose VIDEO_TS folder or video file. Step 3: Choose the DVD title you want to rip to MP4 and select chapter. If the DVD has many titles, then Handbrake will scan them one by one and usually select the longest title, however, the selected DVD main title may be the wrong one because Handbrake doesn't have the function of auto-detecting the right DVD movie title for you. Step 4: Click "Browse" to set a target folder to store the ripped DVD movie video. Make sure the destination folder have more than 1GB free space. Step 6: Adjust the video/audio/picture settings. This part is a little bit complicated for novice users. 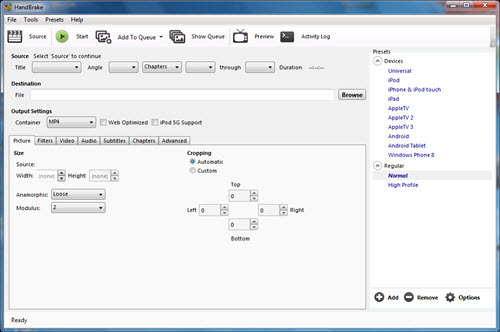 Different settings will output different video quality and size for the MP4 file. Check below chart for detailed information or visit Handbrake Windows Tutorial. Step 7: When everything is settled, you can click "Preview" button to select a part of the DVD movie to preview the output effect. If you are satisfied with it, then just hit "Start" button on the top to begin ripping DVD to MP4 video file with Handbrake on Windows 10/8/7. You can view the status of the DVD to MP4 conversion process in the bottom of the program including Avg. FPS, time remaining, etc. Below is the detailed test data of using Handbrake to rip DVD to MP4, incl. DVD disc loading time, ripping time, ripping speed, output video quality and size, etc. 1. Handbrake doesn't support ripping DRM-protected DVD to MP4, for instance, DVD CSS, region code, RCE, Sony ArccOS, UOPs, Disney X-project DRM DVD. What's worse, it always selects the wrong DVD main title. 2. Handbrake always outputs bad video quality and users can bear to watch it. 3. Handbrake takes quite a long time to load DVD disc. 4. The interface and settings of Handbrake are complex and it is not suitable for beginners. 5. Handbrake sometimes crashes in the half way before finishing the ripping process. 6. The output profiles in Handbrake are limited to MP4 and MKV. If you need to rip DVD to other popular formats like AVI, WMV, MOV, etc., Handbrake would be useless then. 7. Handbrake is not updated often and lacks technical support. If you make the best settings when ripping DVD to MP4 with Handbrake, you still get a bad output video quality. Or if you constantly can't rip DVD with Handbrake smoothly for whatever reason, you may seek for help from WinX DVD Ripper, the best free Handbrake alternative for Windows (10) used by numerous people. It is also a 100% clean and free DVD ripping tool which is faster and smoother, better still, it can output original quality and remove DVD CSS, region code, RCE, Sony ArccOS, UOPs protections. Users can use this stand-alone free DVD ripper for Windows (10) to convert DVD to MP4 with original quality at fastest speed flawlessly. First of all, free download and install WinX DVD Ripper on your Windows 10/8/7 computer. Then follow the 3 simple steps below to rip (protected) DVD to MP4 file with the best free Handbrake alternative. Step 1: Launch free DVD to MP4 ripper and insert the DVD disc to the DVD-ROM. Click "DVD Disc" button to load the DVD movie. This smart free DVD ripper can auto select the right DVD main title for you. Step 2: Select "to MP4" as the output, and customize the video/audio parameters according to your own needs. Step 3: Click "Browse" to set a output folder to store the video and hit "Start" button to rip DVD to MP4 with the best Handbrake free alternative right now on Windows 10/8/7. 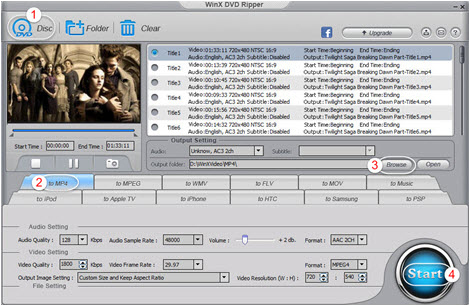 WinX DVD Ripper Platinum/for Mac - A 100% clean, fast and easy-to-use DVD ripper can rip any copy-protected DVD (incl. newly-released Disney DVD) to MP4, AVI, WMV, MOV, M4V, MPEG, H.264, etc. with original quality for easier playback on Windows 10/8/7, Mac, iPhone, iPad, Android, etc.